Some of the links below are affiliate links. Thank you for supporting Southern & Style at no additional cost to you! Number one of this week's Ten has to be a shout-out to yesterday, Memorial Day. We sometimes take our country and our freedoms for granted, especially in today's political climate when it feels like so many things are going wrong. 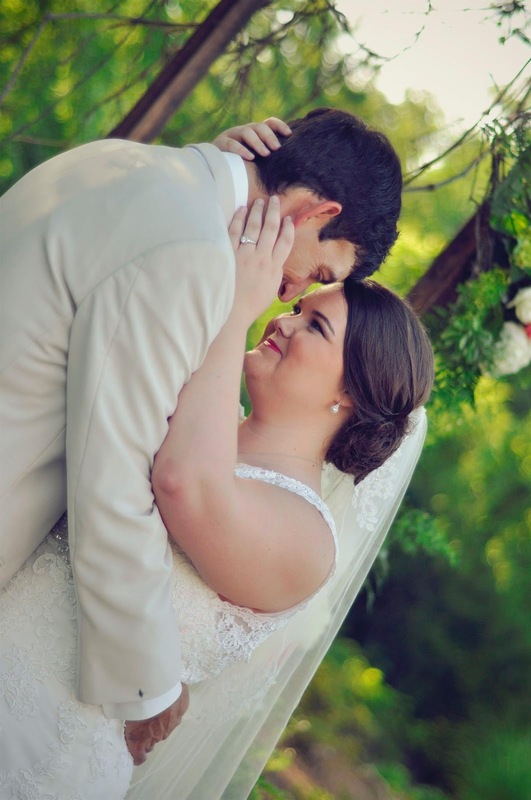 Tomorrow will be Christopher & I's three-year wedding anniversary and honestly it feels like we just got married yesterday, but also like we've been together forever if that makes any sense. He is my absolute best friend & I love going on new adventures with him. I've been reminiscing both on our wedding day & our beautiful honeymoon in Savannah and while those were both wonderful, I'm excited to begin the journey of raising our little boy with him in September-this will be the biggest trip of our lives, I'm sure! This past weekend, Chris & I tried out a couple of new recipes (& by that I mean, I cooked them and he ate them 😂). They all turned out so good & I wanted to share them with y'all & stick them here just in case I ever need to go back & reference them. These pancakes were so light & fluffy-and easy! I also added a dash of almond extract to some of the mix, it gives it a little different flavor that I love. I love, love, love a good corn salad and this one was great. I grilled my corn for some added flavor & added a few more tomatoes. I also plan on trying this over lettuce and adding jalapeños and feta to it for a little different flavor in the future. My husband requested Strawberry Shortcake at the last minute, so I had to find an easy recipe...and I've never made this before in my life! It turned out really delicious and didn't take long at all, you probably have most of the ingredients on hand too. Forrest is really my first giant-sized inside/outside dog & y'all, I love it. He's my sidekick. We go everywhere together. In fact, he's laying on the floor right next to me while I'm typing this. My favorite is his begging face though; we hardly ever give him human foods but that face almost gets me to give in! How could anyone resist it? As September draws closer & closer, of course we're thinking more & more about our little boy's arrival! 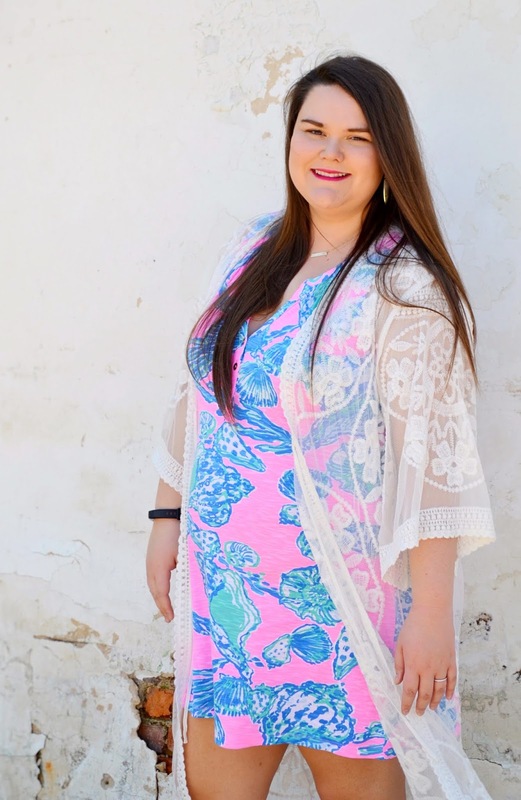 Amanda from A Sweet Simple Southern Life shared her Thoughts for a New Mom over on her blog since her little Anna Claire is a month old now. There's so much advice floating around out there, but I loved her take on it! If you haven't seen the "bad lip reading" of the Royal Wedding-you've got to watch it-it's so funny! Saturday morning I was at my parents and had to check in on these three. I had slowed down on riding even before I got pregnant, but now that I can't ride, I want to even more. Why is it that when we can't have or do something, we want it even worse?! Counting down the days 'til September for more than one reason! Have you seen Lilly Pulitzer's new bathing suits that were just released?! I'm dying over this one-it's a one piece, but still so fun and playful. The other day on someone else's blog (I honestly can't remember who's, I wish I could!) I heard of a website called ThriftBooks. Y'all know I'm already thrifty when it comes to book-buying because they can be so expensive and sometimes only get read once. 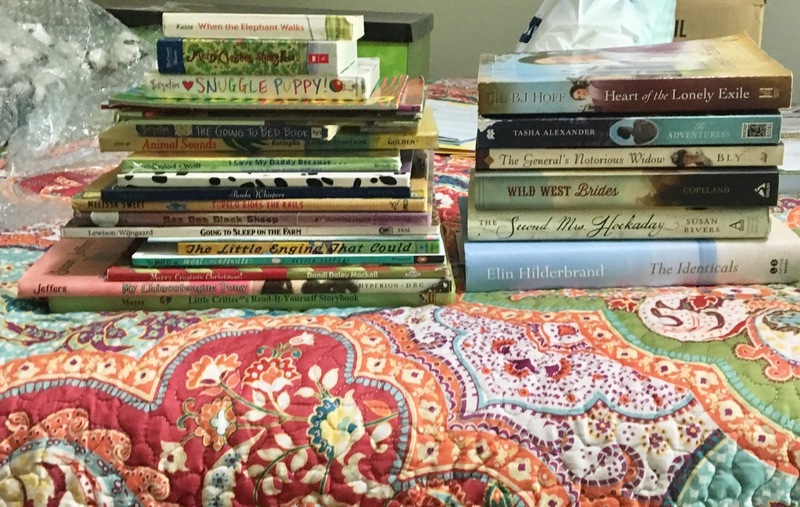 I'm also trying to save money while building up our little guy's library, so every penny counts but I do want him to have a lot of great children's books! So far, I haven't made any purchases but I've found them to have pretty decent prices (not as good as the actual thrift store, but the selection is much better) and all the reviews I've read are positive. Have any of y'all tried this one out? I may have to make an order and report back! 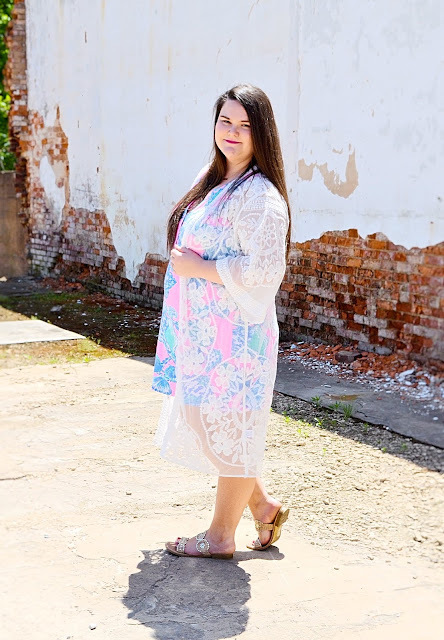 Y'all this is one of my all-time favorite looks that I think I've ever showed here on the blog! It's a combination of some of my favorite pieces that truly are perfect for obtaining that light and easy summer style. 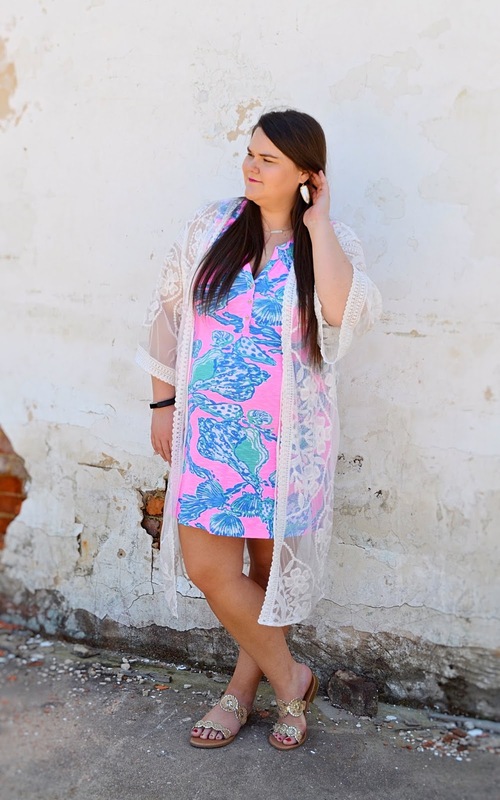 It's no secret that I'm a huge Lilly Pulitzer fan and these Essie dresses are some of my favorites to wear because they're just so darn easy. 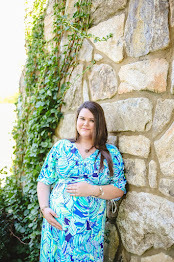 They're a tank dress that easily stretches (peep the growing bump in that last shot!) and the dress is just so light and wearable. I have two and took them both on our beach baby moon last weekend because they're perfect for hot days. 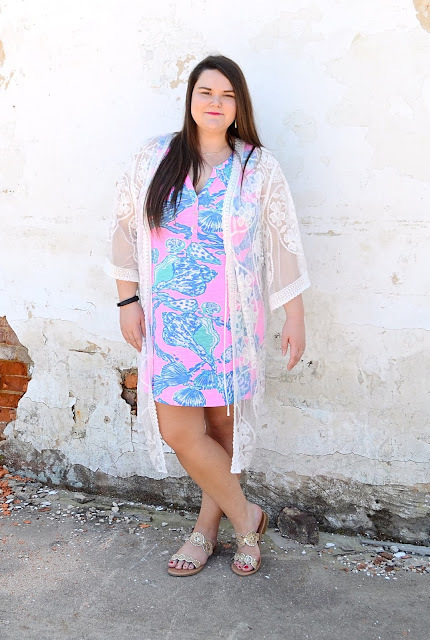 I'm a little shy about showing my arms (one of my least favorite features) on camera, so I thought why not break out this beautiful light, lace kimono as a coverup of sorts? It's ideal because it doesn't add any additional weight, but just adds the right sort of covering to shield any worry zones. Just touching really quick on the shoes I'm sharing today-they're my favorite sandals for summer & they're a dupe for a designer piece! They may not last as long as their more expensive counterparts, but for only $19 I can afford to buy a new pair, wear them out, and then repurchase. P.S. if you noticed that I'm actually not blindingly white in these photos, it's not because I tanned-it's because I've found my holy grail beauty product. I hope y'all enjoy the rest of this long weekend-let's celebrate that it's a long one! Y'all-I have been such a bad blogger with my week-long break, but it was much needed! One of the biggest and most exciting things that I want to recap is the last minute baby-moon that Chris & I went on Thursday through Sunday. We had a blast, just relaxing and enjoying each others company. It was so important to me for us to take one last "just-us" trip before the baby comes in September because although we may go on trips just the two of us in the future, this will be the last one where we won't be missing him! Day 2 of our vacay was spent exploring the 30A, especially Seaside. It was Chris' first time there & I loved showing him all of my favorite spots. We stayed at my favorite place in Panama City Beach, a condo in Emerald Beach Resort. 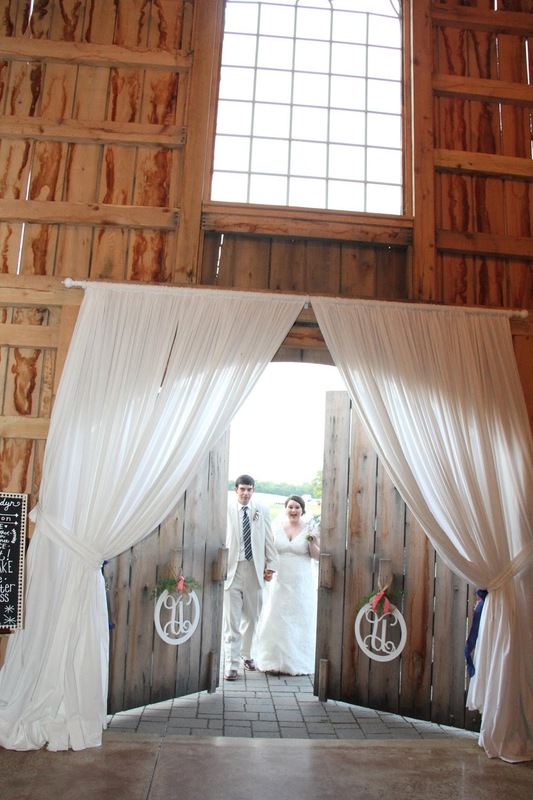 It's such a great spot that is centrally located to our favorite places and we love it. Another favorite spot-St. Andrews! It's the opposite direction of 30A from Panama City Beach, but we love this little bay town. They have the best restaurants that aren't packed with tourists (I'm looking at you, Hunt's!) and the cutest boutiques, antique stores, etc. Plus it's always fun to stroll around the marina before or after your dinner. After being at the beach, all I'm craving is seafood! Luckily, I found this super easy and delicious sounding recipe from a blogger that I've been following for a long time-I can't wait to try it out. Whenever we travel, I try to condense my products into as few bags as possible-my favorite travel case is this one from Vera Bradley. It has four zipper pockets inside (two are clear) and it hangs up, so once you get to your vacation spot, you can stow it on the back of the bathroom door or wherever you'll be getting ready. I use mine for all of my makeup, brushes, and most of my jewelry as well! I shared this over on Instagram; but y'all-without my planner & journals, I wouldn't lose my head. My Q&A A Day Journal is a one-line question/answer journal for each day for five years. I'm on the fourth year now and it's so fun to see how my answers have changed over time. 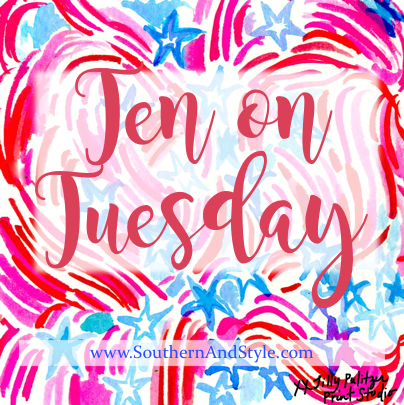 I've filled up my PaperSource journal & have moved on to a bright, Lilly Pulitzer journal for the season-journaling really helps to keep my mind clear and I love the memories that I've collected over the years through my journaling. 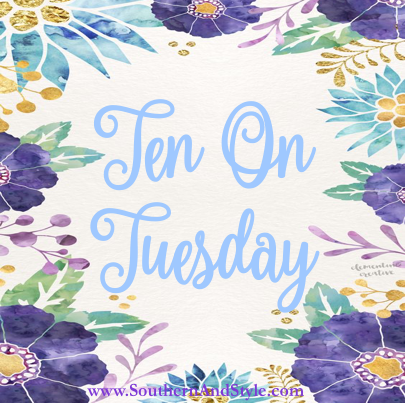 I've been using the Essential Planner since the beginning of the year & I've really enjoyed the change in it from my Erin Condren that I've used in year's past. It's more affordable (at $36, with 20% off using the code TAKE20) and I love the organization that it provides. I bought a three-pack of Soap & Glory's Body Butter's from Target during the after-Christmas sales and have been testing out the Smoothie Star. Not only does it work so so well at keeping my skin hydrated, but it also smells amazing-pretty much like a wedding cake or some other delicious dessert-I highly recommend. 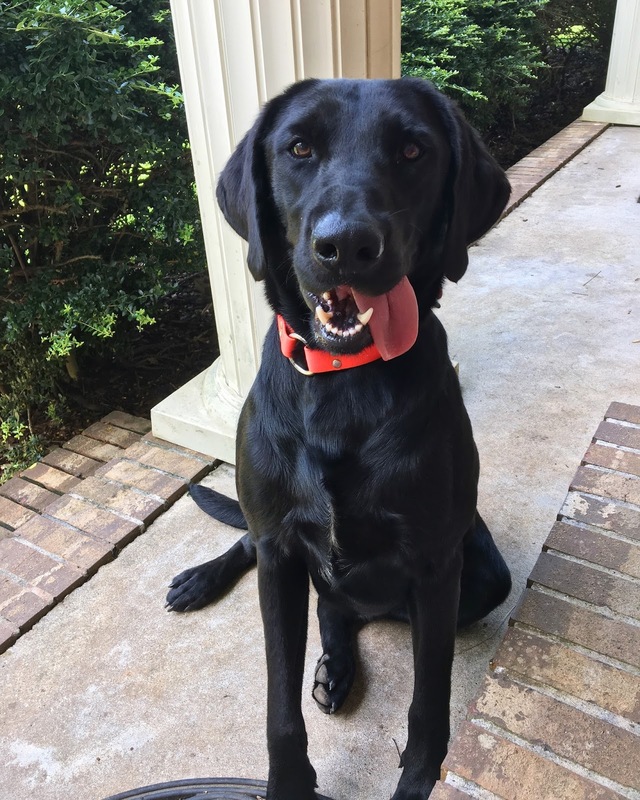 If you're looking to add a furry-friend to your family; Good Housekeeping has rounded up the 20 Best Dog Breeds for Kids-it's no surprise that Labrador Retriever's are #1...I mean, look at this face?! On Monday I had my 24-week doctor's appointment to check up on our little guy (who's doing perfectly!) and my sister & I stopped in at Lilly to see all the new pretty arrivals. I couldn't help but pick up the new Tunic Popover in Mermaid's Cove; it just sucked me in-it's so pretty & still roomy on me at 5 months along. Another travel-size thing I tested out on our vacation was the Glam Glow Supercleanse and I'm so glad that I tried it out...except for now that I'm addicted! I've been having some problems with acne on my chin (thanks hormones) and after just using this for two days it had that almost completely cleared up. My Sephora Play! box strikes again and makes me want to buy something new because it's so great! 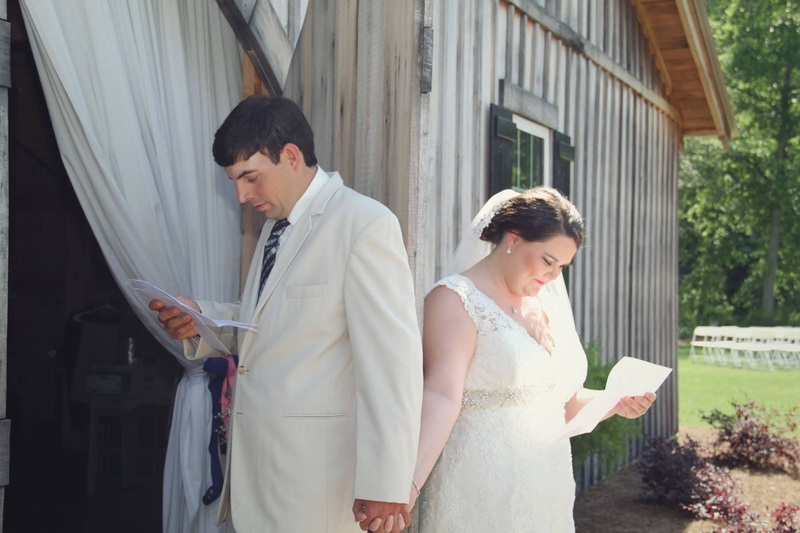 Are you getting hitched in 2018? Southern Living rounded up the best new wedding polishes for the year & some of them are so pretty! I think "You Make My Dreams" is the prettiest of the bunch! Adding this Pecan-Peach Cobbler recipe to my collection because those are two of my favorite flavors! The recipe sounds really easy & can be made in advance and frozen-perfect for pulling out before a last minute get-together. 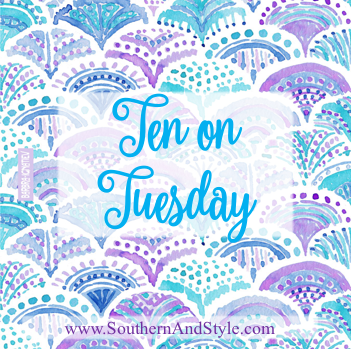 Some of the links below are affiliate links-thank you for supporting Southern & Style at no additional cost to you! If there's one trend I'm willing to jump on for Spring & Summertime, it's going to be the statement earrings trend! Yellow is a color I don't have enough of in my wardrobe, but these bright, geometric earrings would be the perfect sunny touch for the warmer months. Kendra Scott is by far my favorite statement earring brand because they're always so well-made & they have an amazing selection to choose from. These aqua earrings would go with so much in my summer wardrobe & I love the tassel/fringe detailing on the edge. 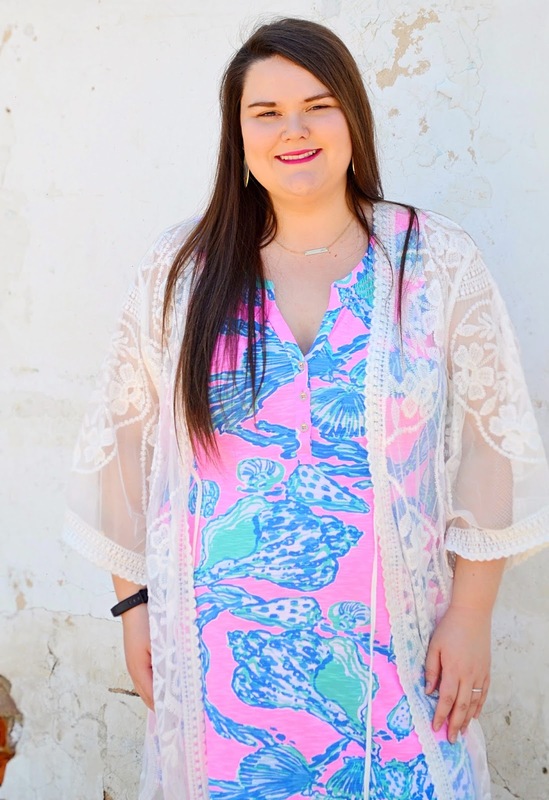 If you're looking for an affordable option-BaubleBar for Target has a ton of affordable options that make just as much of a statement as the original brand. 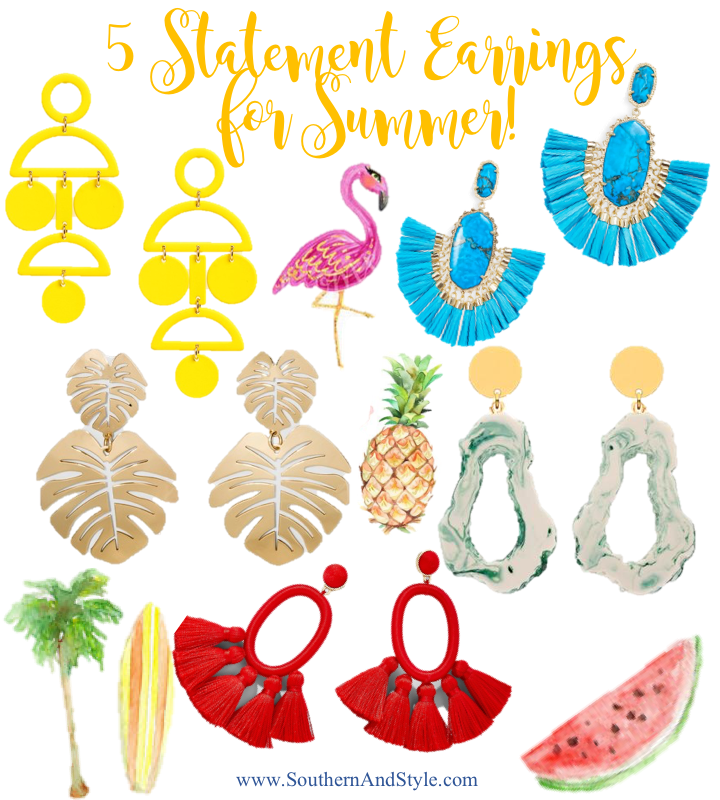 I love the tropical feel of these earrings, so if you're headed off on vacay-make sure you pick these up for just over ten bucks right now! These are the earrings that made me want to put together this entire roundup because I just fell in love with them. These are some of my favorites on BaubleBar's own website right now because I think red is a great color for summer, especially the Fourth of July! These are a similar option from the SugarFix line at Target (currently on sale for just over $10), but they don't come in red-only pink, black, aqua, and white-but those are still some great colors for Summer for a nice price! Which pair are you lusting after?! I definitely need to save up and grab those Amber Sceats earrings before we head off on a trip! This post contains affiliate links. Thank you for using these in support of Southern & Style at no additional cost to you! Y'all, I could literally browse antique stores every single day and probably never get bored. They're a combination of home decor & history, two of my very favorite things and I just don't get sick of them. It's like a museum where everything is for sale. Okay, did anyone else watch the Kentucky Derby this year? I totally meant to talk about it in last week's post, but it slipped my mind completely! I picked Justify (aka, the winner! ), mostly because I love his jockey-Mike Smith. He's such a talented guy & he spoke so highly of Justify. He was the only horse in the field that finished the race with a clean nose, so I call that a double win. I shared this quiz with my mom on race day; "Is This The Title of an Audiobook or the Name of a Racehorse?" Y'all should all take it and let me know your results! Did you check out Saturday's post yet? 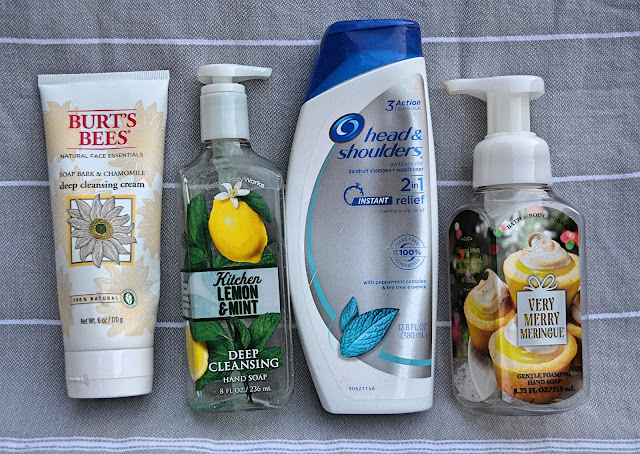 Like I said, my sister and I were out and about so I didn't get a chance to share it around like I usually do, so you may have missed my big Empties review, but it was a really great roundup with lots of information. I would love to know if you use any of the products I used up! Don't forget your Mama's y'all! 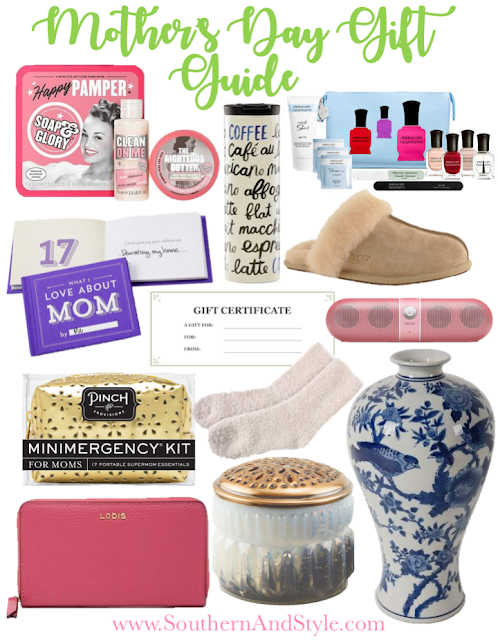 My Mother's Day Gift Guide is still accessible and has some really great picks, even for you last minute shoppers. If nothing else, go pick her up a card and write her a sweet little message-she'll treasure it! While my sister & I were out shopping Saturday, we went to Old Navy for her to make a return and I ended up buying another print in the same dress I purchased last time around. We spent lots of time with this sweet pup this weekend; we're really trying to soak up all our time with Forrest that we can so he doesn't feel like second fiddle when the baby comes. I think he's going to be a great big brother! I am a huge sucker for Italian food, so when I saw this recipe for antipasto squares, I knew I had to add it to our menu! It's got all my favorite flavors; pepperoni, pepperoncini, cheeses-all the best things in life. When I test it out, I'll let y'all know the results. I was browsing around the other day & stumbled upon this dress and thought I might recommend it as a wedding dress to some of my friends that are getting married soon...but y'all, that price tag! Does anyone else watch How Jen Does It on YouTube? Her videos are perfection; they're usually fairly short, but they're all about how she maintains her household (aka, cleaning & cooking basically). She recommends this mop & since Amazon has it right now for $45 with two spray bottles & four mop pads, which is a great deal-so I snapped it up & it should be here next week sometime. Ignore all the junk in the background of this picture; but I just had to share my book haul from this past Saturday. My sister & I took a truckload of boxes from my house to the thrift store to donate (we've been cleaning out in preparation for adding all the baby things!) and I stopped inside to browse through the books because that store has great prices. I got the entire pile of children's books (on the left) and the pile of books for me (+ one more hardcover Elin Hilderbrand book that I've already started) all for $23. It's 29 books total so I think I did a pretty great job! 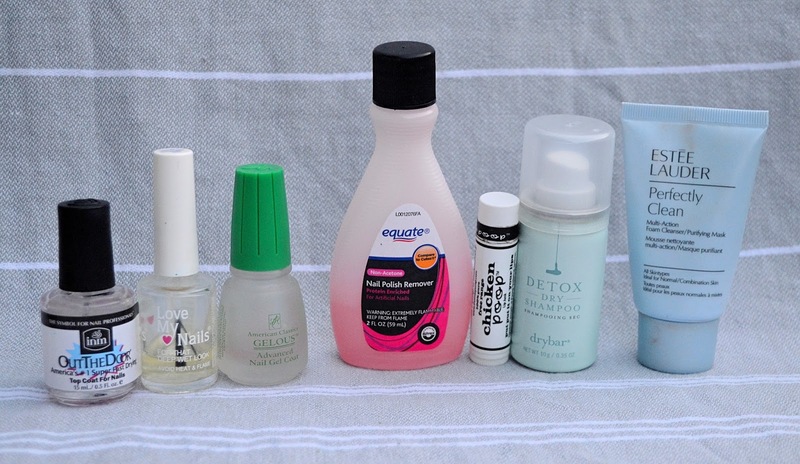 I'm sharing an Empties post with y'all today (aka, I'm going through my beauty trash & sharing mini reviews of each item!) 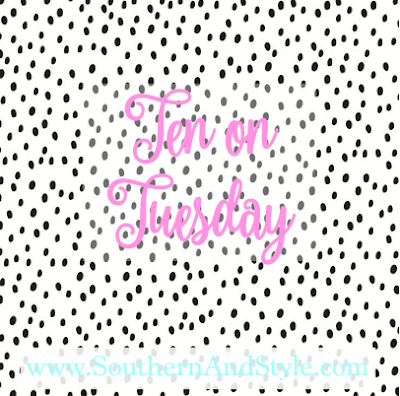 and I'm excited because these are some of my favorite posts to do and I haven't done one since last October! There are a ton of items in this post, so I'm just going to jump right in & start sharing. . . This was a great scrub for a great price, the tub lasts forever! It smells like maple and left my skin feeling super smooth and soft after use. I've got a few scrubs to use up, but I will definitely buy this again. This is an excellent mask for clearing up your skin, unfortunately I just didn't go through this massive tub fast enough and it started to get mold on it so I had to toss it. They now sell an 8 oz tub, instead of the 16 oz once I have, so I would probably purchase it again in the smaller size. This is my favorite body butter to apply after showering, it smells amazing-floral and sweet. I've already got a back up of this stuff because I don't want to be without it ever. I bought a Burt's Bees gift set after Christmas on a discount and this was a product in that set. Unfortunately, I didn't love this cleanser. The cream wouldn't really spread around on my face and it has menthol making it almost sting. I mention another soap from the B&BW "Lemon" line in this post, but this one is not my favorite. Mint & lemon just don't seem to go together. Plus, the deep cleansing formula isn't my favorite. I bought this shampoo to combat some of the itchy scalp that I get when I use dry shampoo too often (whoops! ), but I didn't really love it. It really does make your scalp tingle, which is fine...until it gets in your eyes. So I'll pass from now on and look for something new. I bought this with hopes that it would be like the Lemon scented hand soap from the Southern line that B&BW did a few years back, but unfortunately it wasn't. It was still good though, and I liked the clean, lemony scent with the Christmas-y packaging for the Winter season. This is my all-time favorite lip balm, it smells so good and almost freshens your breath when you use it. Highly recommend this & I can't pick another one up fast enough. 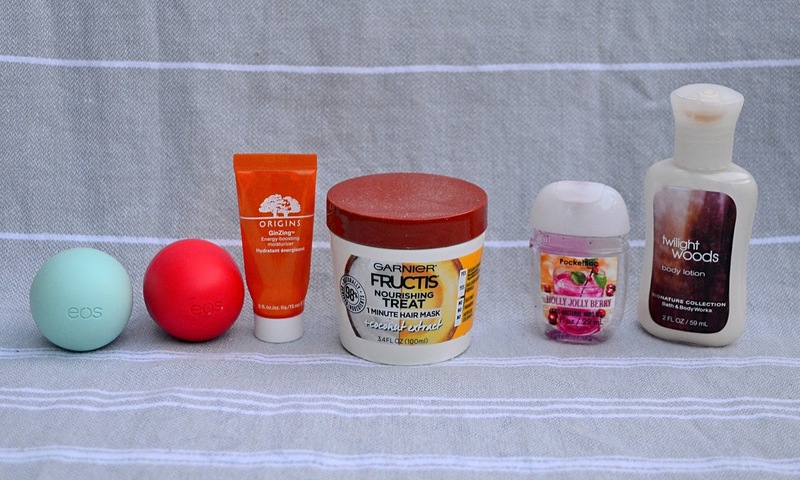 I always keep a lip balm by my bed, by my seat in the living room, in my purse, etc. and so while I did use this one up it just wasn't my favorite flavor. It was just okay. I love this moisturizer so much. It's so good. It goes on so smoothly and soaks in immediately. The smell is citrusy and delicious. I would definitely consider picking this up again, in the future, especially if I saw it on sale. The smell was decent, but it didn't smooth my hair or anything at all. It didn't even help make it manageable, much less repair frizz. This was another little Christmas gift-y from my mom that I kept on my desk while teaching & then tossed in my purse once I wasn't teaching anymore. It smelled slightly sweet and clean, I really liked it and would love to get another one again around the Christmas season. I always try to keep a small size of lotion near my seat in the living room, just in case. This has been there for a while just because the scent is so strong. It's a musky scent, which I used to love but it's just too much now. I did use it up, but won't repurchase. Don't let "snail" in the name fool you, this stuff is really good. I can't speak for the anti-aging benefits because obviously that's going to take a while to notice, but I did notice how soft and manageable it left my hair feeling which is very important to me. While not my favorite soap formula, I really enjoyed this scent. 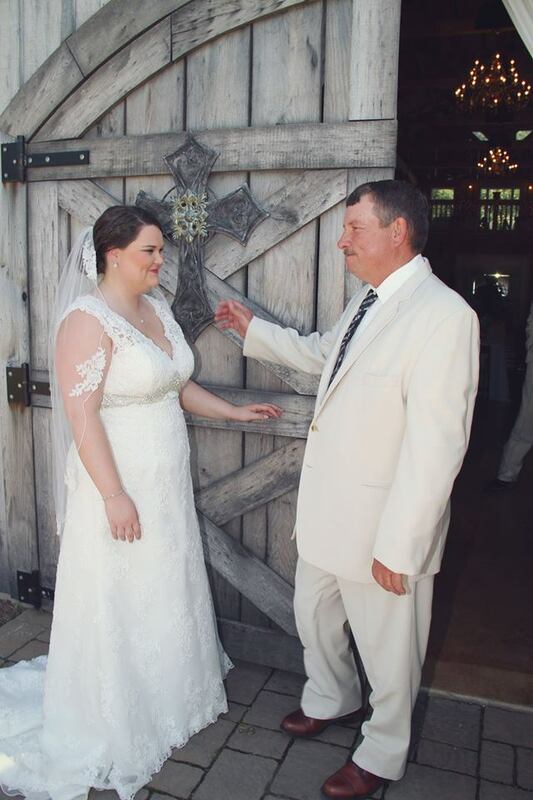 It was super fresh & clean, I loved it for the Fall season into Winter. Hopefully they'll bring it back this Fall! 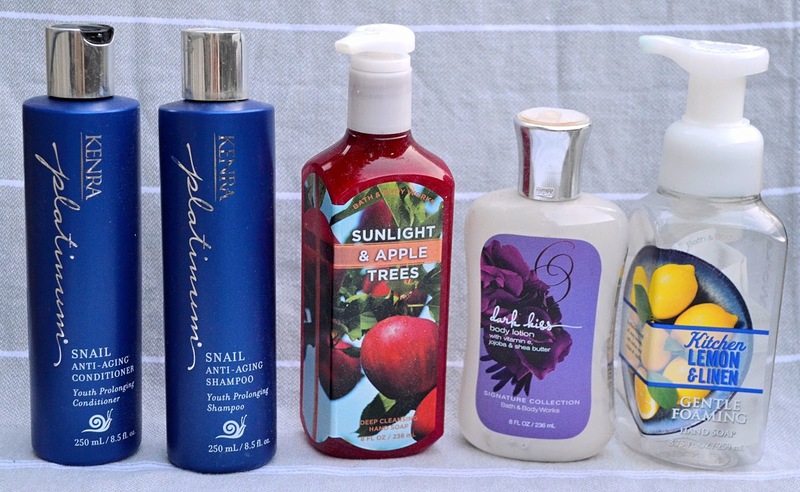 I'm trying desperately to use up a ton of my lotions & potions, and this is one of those. I kept it by my bed and overall I was pretty pleased with it, although the moisture didn't last long on my skin. 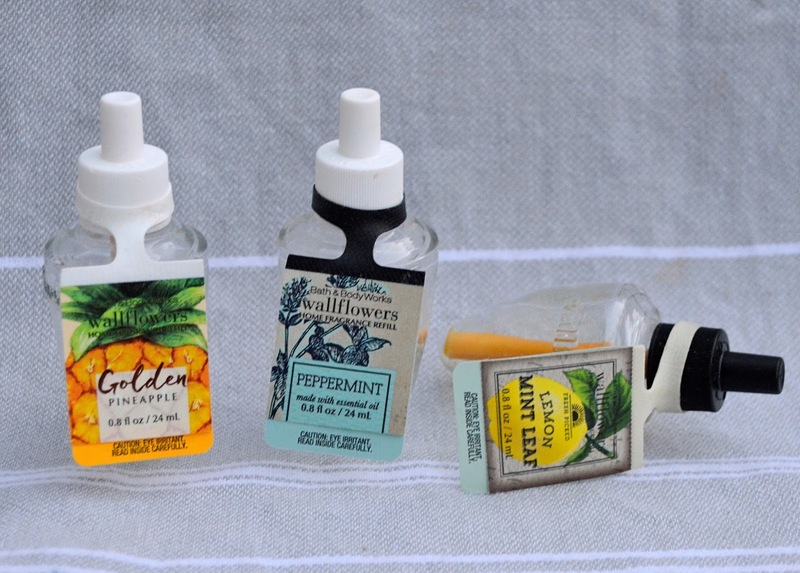 The scent is a sweet, musky scent that I love-especially for Summer nights. I love anything lemon (if y'all have been here for a while, you know!) and so when B&BW came out with a ton of "lemon" scents I was so excited. This one was so good and clean, hopefully I'll see it again because I loved it in our bathroom. I tried a spray deodorant for the first time in 2017 and will never go back. They're so much more sanitary in my opinion and I love how they feel on my skin. This one lasts all day and doesn't leave marks on my clothing. I really, really liked this moisturizer and noticed the difference it made in my skin. There are lots of good moisturizers at the drug store right now, but I think this is a really great hydrating one for summer. I love the plain Jergens Wet Skin Moisturizer, so I thought a self-tanner version was a no brainer...I was wrong, y'all. It smells funny & left my skin colored patchy. I'll pass. If you're looking for a basic facial scrub, pick this over the St. Ives Apricot Scrub because it's the same thing. There are better ones on the market, but this is a pretty nice cheap alternative. If you want a really nice looking, quick-drying topcoat then I recommend picking this one up at Target. It's not very expensive and works so well. I used mine too early over red polish, so it took on red and then got a little too gloopy for my taste, so I replaced mine, but at the under $5 it's easy to do. When cleaning out my nail polish, I realized this clear coat had turned colors and was almost empty so I'm tossing it. I have a few topcoats that I love more than this, so I won't repurchase. It's a nice budget buy though. If you love the look of gel nails, but don't want to damage your nails or spend the $$$ at the salon, then pick up this gel-coat. I get mine from Sally Beauty Supply, but they also have it on Amazon. It makes your nails look super shiny and have that gel thickness to them. If you're ever at Wal-Mart in the travel items aisle thinking you should purchase this to take on trips, etc. turn around and walk away because you shouldn't. It literally didn't take off anything. I tried & tried & tried. Ignore the funny name, but embrace the great formula of lip balm! I love my Chicken Poop lip balm because it really does moisturize and doesn't have a crazy scent. I keep one by my bed currently and have to try to keep my husband from stealing it. I got this in a Sephora Play box & fell head-over-heels in love with it, so much that I went to Sephora and picked up a full size. I love how clean it makes my hair feel and the scent is really nice as well. I used this cleanser as a travel cleanser, until I only had a few uses left and just used it up at home. It was okay, a little drying on my skin and it was hard to get all of the product out of this packaging. I probably wouldn't purchase full sized. You definitely need to click that link to go see the brush on this mascara because it's so crazy. I didn't mind the crazy brush, but it wasn't my favorite formula. It was pretty lengthening, but I also need thickening. I picked this up after hearing some YouTuber's chat about it, and I did use it up...but it was just okay. I wouldn't go out of my way to repurchase, but I might try the Pro-Glow version. This was a really nice basic bronzer, I hit major pan on mine & then it broke leaving it difficult to use. I've found other bronzers that do a better job, but if you're just looking for something quick, easy, and inexpensive then this is a great option. 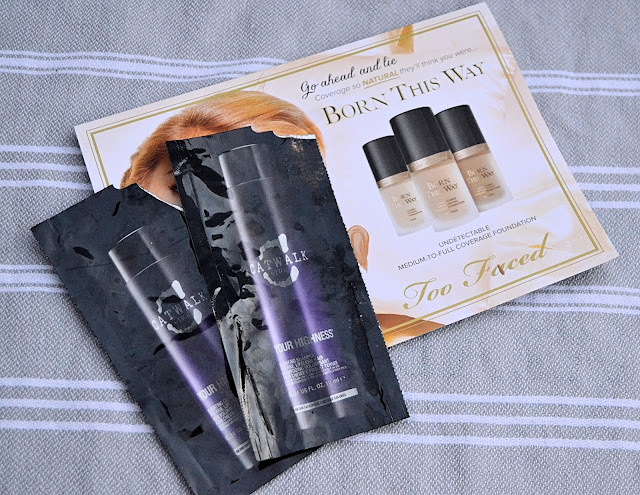 I got this in an Influenster box I think, I just didn't care for it enough to even use it up. It's a brow mascara, but I prefer a pencil or powder for my brows. 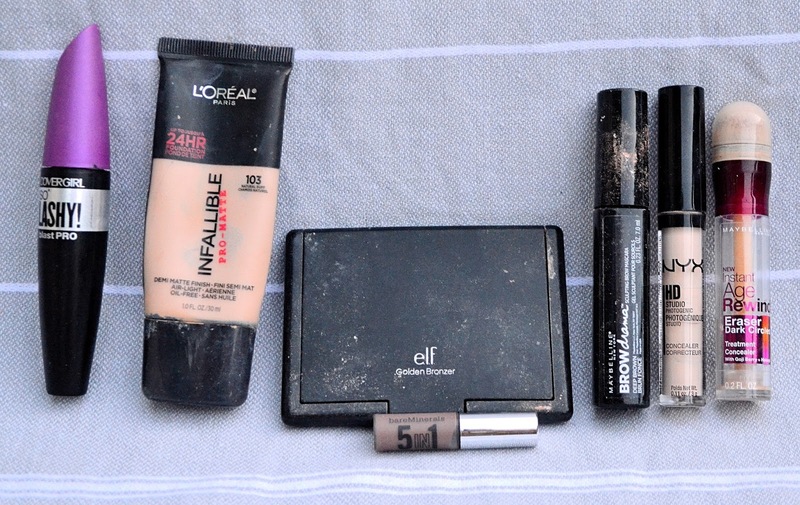 This is my trusty concealer that I always fall back on when I'm not sure which one I want to test out at the drugstore. I currently have this again right now & may pick up another as a backup. I picked this up on a whim and while it performed decently, it just was just okay. 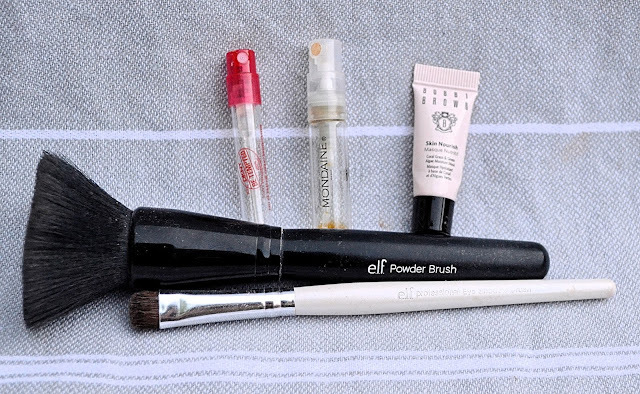 It's not very thick, so if you prefer a thinner formula this might be up your alley. This sample is from when I had Ipsy (aka, I should've tossed this a long time ago). I never really liked it because the formula wasn't great and it didn't blend well. Don't really recommend unless you really like a natural look. They're great for travel or tucking in your purse for on-the-go, this one was a really nice apple-y scent. It didn't win me over enough to want to purchase full price, however. This was a very strong, sweet, and heady perfume. I enjoyed it for the cooler months as a nighttime perfume, but once again-not enough to purchase. It was kind of forgettable. 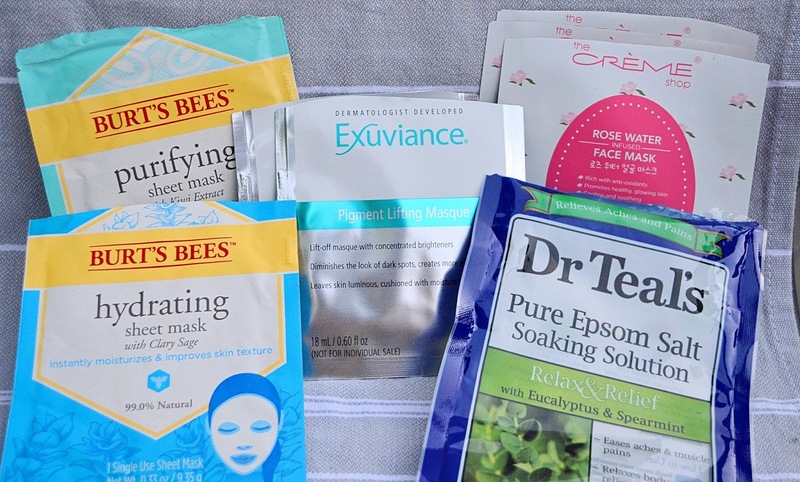 This was my first go at a sleeping mask and while I liked it for it's moisturizing benefits, I just felt like it was too pricey for what it was. The scent is quite nice though and a little bit does go a long way. This is a very soft powder brush that comes in at less than $5. I enjoyed using it for many years, but even after washing it over and over it just felt like there was build up so I replaced it. It's a great brush for the price though! This is totally embarrassing, but this is probably the first eyeshadow brush I ever actually bought (instead of using the ones that came with eyeshadow). It was decent for packing on pigment, but after so many washings the head falls off of the handle and it's time to say bye-bye. 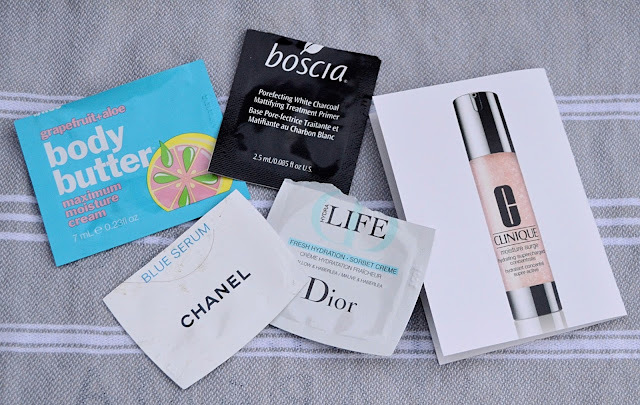 This sheet mask was different than anything I had ever seen before, it was almost like a cleansing mask to remove leftover traces of dirt, oil, and makeup. 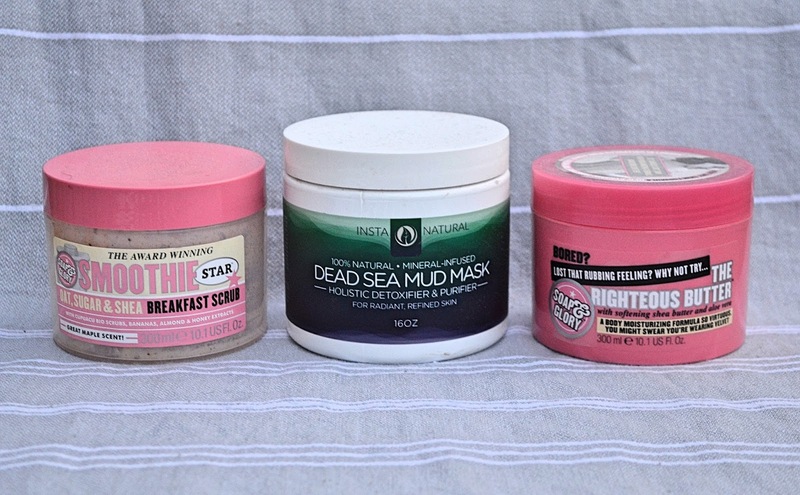 I tried it one night when I took a bubble bath and it was okay, just not my favorite mask and I wouldn't buy it. I got this mask for Christmas & while I love Burt's Bees, this sheet mask just didn't do it for me. The mask itself is textured and felt kinda funny on my face, plus it wasn't very saturated (which I love in a sheet mask, especially a hydrating one). It wasn't bad, but I didn't fall in love with it. These masks are a little pricey, but man do they work well. 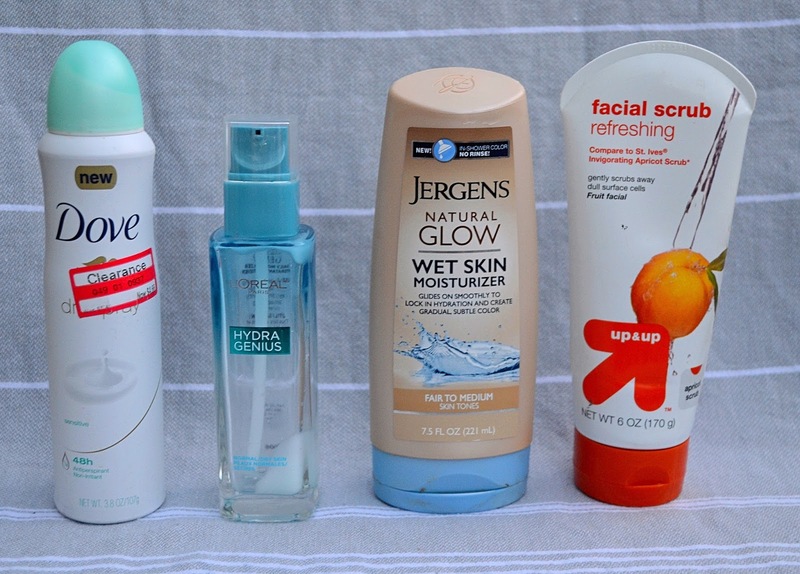 I know that when I use them once a week or every other week, they really do a number on getting rid of my dark spots and acne scarring. Next time I spot them in a sale at Ulta, I might snap them up! 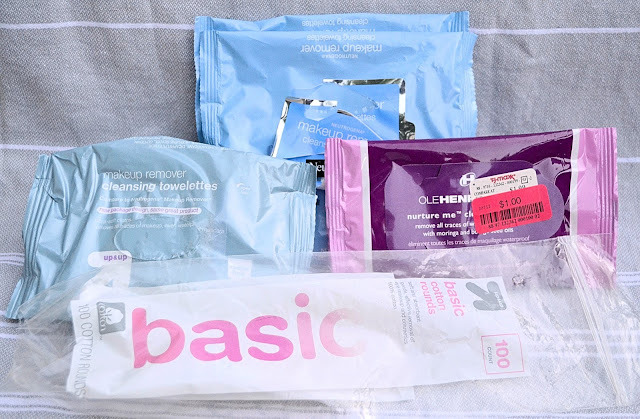 I always search out The Creme' Shop face masks at TJ Maxx because they're always a great price and they always do me right. I've used four out of the five in the box (I'm wearing one right now!) and they really do a great job. I love this one for hydrating and reducing redness, plus the scent is really light and nice. They also fit my face really well, which is a huge plus. I used this in my last bath and I loved how it made me feel. The scent was really nice and soothing and I felt like it just soaked away my sore, tired muscles. I would definitely purchase this again, especially since it's such a good price. I used up two packs of these wipes since October and they're still my favorite wipes to use. I love how moist they are and how they glide on my skin. I got these in a Target Beauty Box & I was pleased that I got to test them out. They would do in a pinch, but they still aren't quite as good as my Neutrogena ones. Ole Henriksen created new packaging, so they had a ton of these for $1 for 10 wipes at my TJ Maxx. I decided I would pick up one packet to test out and while they did smell good, they didn't glide well across my skin so I probably wouldn't purchase the newly packaged ones. These are the cotton rounds I used to take off my makeup and sometimes nail polish. I recently accidentally picked up the premium rounds and actually, for just a few cents more...I like the premium ones better! They're very soft, so I might be converted into premium over basic now. My Target just started carrying Bliss, and I do love a good citrusy scent...but I won't be picking up this one, only because I've got enough body butter and lotion in back-up. If you need a good body butter and prefer citrus over sweet, then this one is a winner! This serum is one sample I always love to get, but will never ever purchase because it comes in at over $100. It's supposed to be a youth serum, but I'm sure you'd have to use it consistently to see results. I do love the boost of hydration I get, but not worth the cost in my opinion. While I always enjoy trying out these high-end samples, but this Dior sample wasn't anything too exciting. I have moisturizers I like that don't cost $70. I got this sample from Sephora with my last purchase & was so excited to test it out...but y'all, I used it once before a meeting and my makeup broke up so bad and patches clung to my skin...it was awful. I didn't even try it out again, I tossed it in the empties bin so y'all would know how much I disliked it. This is my favorite type of moisturizer right now, a hydra-gel type. However, you don't have to pay Clinique prices to get this! Go to the drug store, they have tons to choose from with similar results for a fraction of the price. I received this in a Too Faced order & was so excited, because I've been wanting to try this foundation out but didn't know my shade. This provided three shades for me to try out and I decided on Light Beige. This is definitely on my to-buy list as a full coverage foundation once I use one of my current ones up! I'm pretty sure my sister gifted these to me from the salon she & her husband owns, and y'all they are so good I just might purchase the full size. They're for thin, lifeless hair and while my hair isn't necessarily thin-it surely needs some help. This gave my hair lift and volume, it made it very soft and manageable as well. Plus the smell-so good! I might as well have named this section "things I love but I can't do while pregnant" because that's what all this stuff is. If you really, really need to work on your skin's texture, the Exuviance Performance Peel will be your life saver. It makes such a huge difference in my skin; in acne scarring, sunspots, texture, etc. and I'm sure I'll have some spots that need to be worked on once the babe is here. 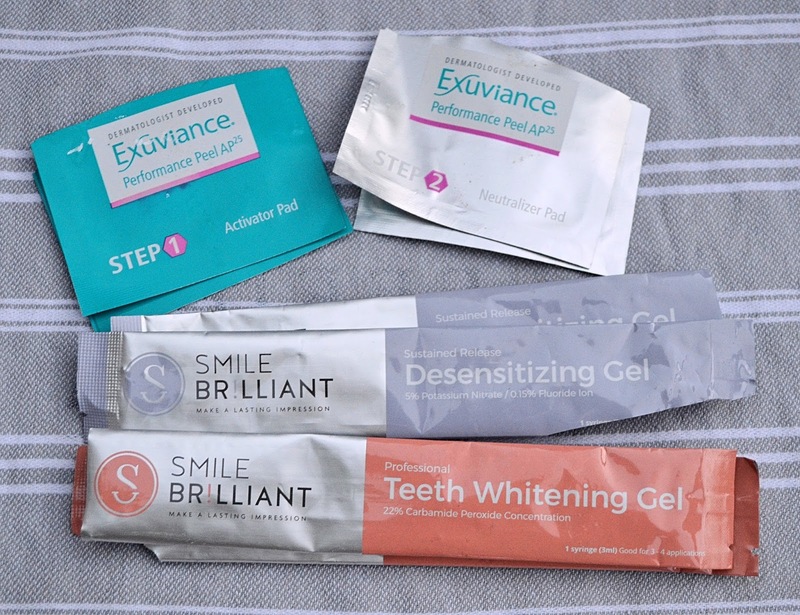 I unfortunately cannot use my Smile Brilliant kit while I'm pregnant, but you can read about my experience here. I loved it so much & look forward to being able to whiten my teeth again once our little guy is here. The desensitizing gel is very important to me when whitening because it keeps my teeth from hurting-so if you get the whitening kit, make sure to add this gel! Like I just said, I really loved my experience with Smile Brilliant & will definitely start again once I'm not pregnant. Their prices are really great compared to professional teeth whitening and the process is so easy. If you're trying to whiten for an event or just to boost your self-esteem, I really love this brand. This is one of the best wallflowers I have ever tried from B&BW. I hope it's going to be back around this summer because I would totally repurchase. It's fresh and sweet, but not a headache scent if you know what I mean. This was a great Wallflower for the Winter season, it was very clean and crisp. I would definitely purchase it again in the future. This was a nice, light scent that wasn't very overpowering. I enjoyed it in our kitchen, but I doubt I would repurchase it again because it just wasn't memorable. 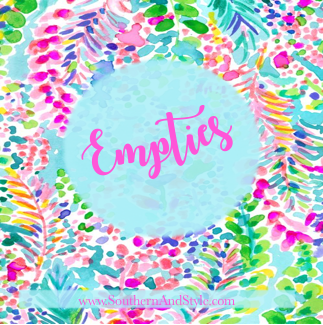 That was a huge round-up of empties, but I hope y'all enjoyed it! Have you used up any of these products (or any products in general)? !